Claude Rutault is a French both minimalist and conceptual artist, best known for the original way of expression he created and titled definition-method, which is basically a manual how to create-update his art piece. He was born in Trois-Moutiers, France and had a highly important role in art in France since the 1970s. Starting 1973, Claude Rutault uses a simple method to create new artworks. That year Rutault began repainting the walls of his kitchen, and covered at the same time a small painting he had left there by mistake. That event revealed him that the canvas and wall were cohabiting in a relationship that is far from neutral and it would be interesting to explore. Basically, what he did is made the wall an integral part of the artwork. Rutauld created a definition- method explanation, a text that forms the instructions of an evolving work that should be ‘updated’ by its ‘taker’ (collector, museum…). As he instructs, canvas should be braced on a stretcher, painted the same color as the wall on which it is hung. The rule is to use standard formats available in the trade, be they rectangular, square, round or oval. Hanging arrangement is traditional. The identity of the canvas color with the wall has led to development of a corpus of over 300 definitions/methods. 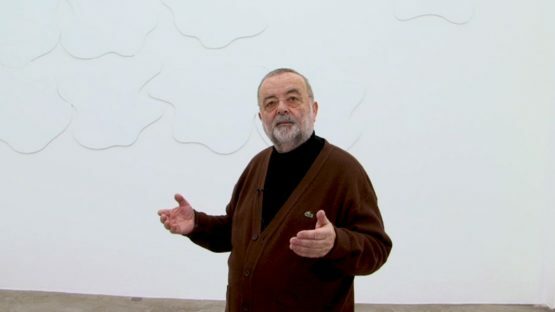 The simplicity of his work goes together with his formulation and critical analysis of the art world, founded on the social operation between the work and the artist, their gallery, the collector, the museum and the auction house. Exposition – suicide was Claude Rutault’s first solo exhibition at Galerie Emmanuel Perrotin. On display were 23 works, both historical works from the 1970s in particular as well as nine new works. The main idea was to take down all the exhibits at the end of the first day of the exhibition: buyer would take immediate possession of those canvases that were purchased, and all the iothers would be immediately destroyed, on the spot. Despite the fact that majority of the art world would define Rutault to be a conceptual artist, he doesn’t see himself as such but always as a painter. Claude Rutault’s work can be found in numerous public collections such as the SMAK Stedelijk Museum; Musée d’Art Moderne de la Ville de Paris, and Mamco, Musée d’art moderne et contemporain Genève. He lives and works in La Celle St Cloud, France.